bartlett mitchell and Inn or Out Events are delighted to announce an exclusive partnership with award- winning chef-patron, Adam Byatt. Adam will be joining as a chef consultant to share his expertise and working with Executive Chef, Pete Redman and all the chefs via master-classes, advising on sustainable sourcing, and providing clients with signature dishes, live food demonstrations and events. bartlett mitchell and Inn or Out Events are known for the seasonality, provenance and fresh, natural ingredients of their menus. Adam’s reputation for sourcing only British ingredients makes this a perfect partnership. “My heart lies with British cooking; reviving classic dishes governed by the watchwords of seasonality, traceability and sophisticated simplicity. 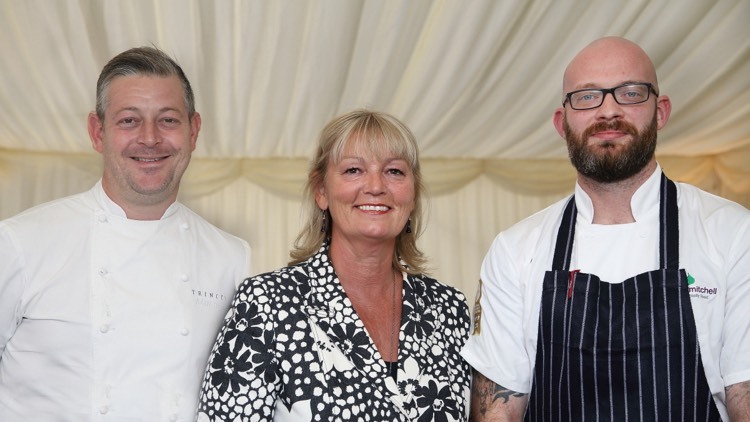 I am looking forward to working with Pete Redman, Executive Chef to mentor the Chef team at bartlett mitchell and Inn or Out Events and injecting my passion for using British ingredients”. Adam’s is the chef-patron of two restaurants in Clapham; Trinity and Bistro Union. Trinity has won the ‘Time Out’ best new restaurant, the AA’s prestigious ‘London Restaurant of the year’ as well as holding three AA rosettes for 4 years. Trinity was voted in the top ten restaurants in London by both Hardens and Zagat and has been in listed the Times top 100 restaurants in the UK. It is regarded as “as close to an absolutely perfect experience of eating out as it is possible to have” said Giles Coren, The Times. Adam has appeared on TV shows including Saturday Kitchen and Celebrity Masterchef. “I am very excited to have Adam on board, I really love his food and he is a perfect fit for bartlett mitchell’s fundamentally food ethos. We are delighted to be working with Adam as our chefs consider Adam to be a chef’s chef who is very serious about his food”.